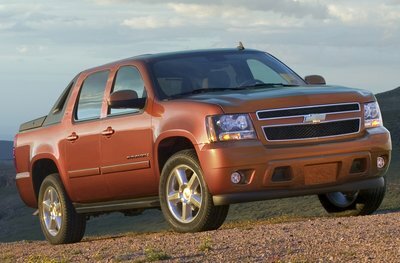 The innovative Avalanche has been redesigned for 2007, and is now based on the latest full-size SUV platform from GM. With the passenger room of a 4-door sedan, and a pickup bed with the Midgate folding divider for increased cargo room, the Avalanche offers unmatched versatility. Engine choices include a 320-bhp 5.3L V-8, or a 355-bhp 6.0L V-8. Both engines are equipped with Active Fuel Management(TM), which improves gas mileage by running on 4-cylinders when possible. Towing capacity is up to 8,000 lbs. The Avalanche is available in 2WD and 4WD models, and a dedicated Z71 off-road package. The optional On-Star system will offer an audio-based GPS navigation. The innovative Avalanche has been redesigned for 2007. All-new styling on the inside and outside follow the updates made to the new Tahoe and Suburban. Engine choices include a 320-bhp 5.3L V-8, or a 355-bhp 6.0L V-8.